Summer is here, albeit briefly, and the time is right for light, cooling meals. Indian doesn’t naturally jump to the top of the list of food choices. But Indians are no strangers to being hot and flustered. During our long summers we have special recipes that soothe the tummy and free the mind. Perfect for a sweltering weekend in London, complete with visiting out-of-town friends and a boho village fete. I thought I would welcome them with a meal that included two traditional summer Bengali dishes – aloo posto and masoorir dal. Aloo posto is a dish of sauteed potatoes smothered in creamy poppy seeds. And masoorir dal is a light, red lentil soup tempered with panch phoron. Together they are perfect partners for a simple, summer meal. As I wondered what would keep our friends sane after an Indian lunch on a hot day, the flash of inspiration came from none other than Sandeepa of Bong Mom’s Cookbook. I love Sandeepa’s blog for her lively stories about growing up in Calcutta, now Kolkata. And the festivities, rituals and food that typical Bengalis enjoyed while I was running around in some half-Punjabi, half-Bengali Anglophile haze. The masoorir dal recipe is from Sandeepa and the aloo posto from a rushed conversation with mother on Sunday morning. The results were delicious and my friends, non-Indians with open minds, thought the world of them. Soak the poppy seeds in water in your food processor bowl. While the seeds soften, wash and chop the potatoes into little cubes by halving them and then cutting each half into quarters. Bring the oil to heat in a large pot over a high flame. When hot, add the nigella seeds. As they start sizzling mix in the grated ginger. Stir for a few seconds until the ginger starts turning brown and then add in all the potatoes. Fry for about two minutes, coating them all over with the nigella seeds and ginger. You could add salt at this stage. When the potatoes are translucent lower the flame and blitz the poppy seeds until you get a pale, creamy, semi-solid paste. You should still be able to feel a seedy texture in the paste. Mix this into the potatoes, coating them well. Now add the whole green chillies, quarter cup of hot water, cover and cook on a medium flame until the potatoes are soft. If the potatoes are raw and the dish dry, add a bit more water and keep cooking. 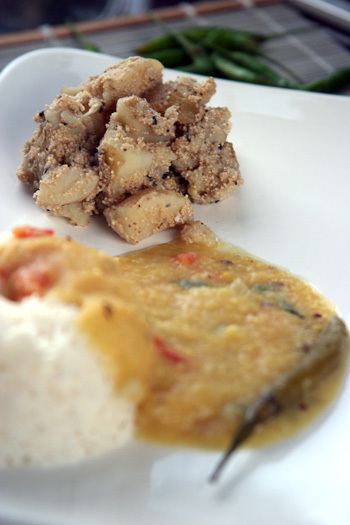 The end result should be a dry, potato subzi with a creamy, seedy texture and a litle chilli bite at the end. Serve this warm, not hot. It’s also super moreish straight out of the fridge the next day. Wash the lentils thoroughly until the water runs clear. Add the turmeric and bring it to boil with two and a half cups of water in a large pot. In the meantime, roughly chop the onion and the tomato. Heat the oil in a small pan over a high flame. Add the panch phoron when the oil is hot and as it starts sizzling, fry the onions and the tomatoes until they are soft and shapeless. By now your dal will have a fibrous texture. Add this masala tempering into it and the green chillies. Keep cooking the dal until the individual lentil bits are cooked but not completely smooth. To finish, stir in the fresh coriander, the lemon juice and salt. Serve it piping hot with Basmati rice. I am so happy that your non-bong friends loved the dal & alu posto. I really feel sad that very few people know about the traditional bengali food and the fact that you touched at least few hearts is a great news. Most bengali food is pretty light and subtle, don’t you think ? Is that a reason that there are very few Bengali restaurants ? Hi, I am here for the first time. You keep a nice blog and I loved your recipes! I can vouch that the results were perfect!! Trying a dish out on Lou on thursday night, I’ll let you know how it goes!!! Wow! great site with yummy recipes. Aloo posto looks awesome. Will try this. Thanks for sharing. I am new to Indian cooking – after 40+ years in the USA, I am trying to learn Indian Cooking. Question: What is “blitz poppy seeds”? Hi Ashwin – great to hear of your recent interest in Indian cooking. When I say blitz poppy seeds I mean puree them by giving them a good whizz in your food processor/blender, where they should be soaking in the water. Perhaps you don’t have a food processor. You could also use a little coffee grinder or pestle and mortar. If this sounds like toooooooooo much effort, just try other simpler recipes like Gujarati aloo where there is no blending needed. Good luck with it all. It’ll be great fun! cool site! Would be great to see it published as a cookbook! 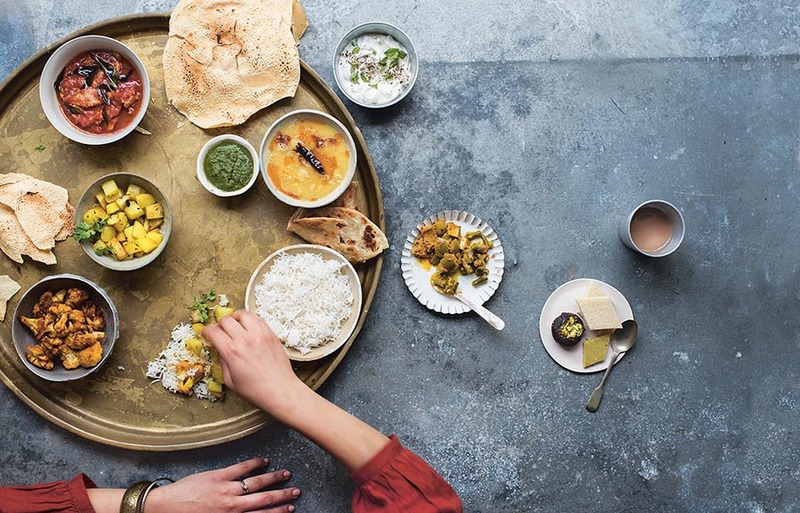 i was just going to respond to asha’s comment on the lightness of south indian food and find that sandeepa has already taken the words out of my mouth! the posto smells amazzzzing btw mallika ~ ill know in abt ten minutes what it tastes like! I was surfing the web when I found your blog. I’m new to London and am trying to find out where to buy posto here. Would really appreciate your telling me. Thanks! I do all my Indian grocery shopping in Euston on Drummond Street. There is an Indian spice shop there, with posto and everything else you need. You can also try shops in Tooting Bec, Wembley or Southall. Just to inform you that in proper bengali alu posto, we don’t put ginger. And alu posto goes well with Urid daal ( beauli daal). Anyway, good going with your cooking. It’s really funny aloo posto with ginger. If you ever go to kolkata, ask the recipe of aloo posto. Im not really a huge fan of indian food, but this looks pretty good. Ill give it a try this weekend and let you know how I like it. I have never used poppy seeds before. Could you advise if you used white or black seeds for this recipe. Thanks!